Beginning in 2000 as a general beer forum, RateBeer developed into one of the largest beer rating websites in the world, with a listing of more than 470,000 different beers in its database as of early 2013. Similar to other beer rating websites, RateBeer maintains an ongoing list of its top rated beers, 50 to be exact. As with our previous analyses of BeerAdvocate and Untappd, we reviewed RateBeer’s Top 50 beers in an attempt to identify any trends regarding brands, beer styles, alcohol content, breweries etc. For fun, we created a sortable list of RateBeer’s Top 50 Beers which can be arranged by brewery, country/state, ABV, etc. This is the same list that we used to generate most of the results below. 5) Bourbon Barrel Aged Dark Lord Imperial Stout – 3 Floyds Brewing Co.
7) Dark Lord Russian Imperial Stout – Bourbon Vanilla Bean – 3 Floyds Brewing Co.
9) Bell’s Black Note Stout – Bell’s Brewery, Inc.
Interestingly, Toppling Goliath’s Kentucky Brunch Brand Stout is the top rated beer on both RateBeer and BeerAdvocate, and Mornin’ Delight from the same brewery also appears in the top 10 on both lists. The three other beers appearing on both the top 10 from RateBeer and Beer Advocate were Russian River’s Pliny the Younger, Three Floyds’ Dark Lord Russian Imperial Stout – Bourbon Barrel Aged and Cigar City’s Hunahpu’s Imperial Stout – Double Barrel Aged. The only beer that RateBeer and Untappd’s share in the top 10 was Double Barrel Hunahpu’s from Cigar City. Of the more than the 100 different beer styles in the world, only 9 appeared in RateBeer’s list of its Top 50 beers. Of those 9 beer styles, it was Imperial Stout that stood out by far with 26 examples of this dark and boozy beer in the Top 50. 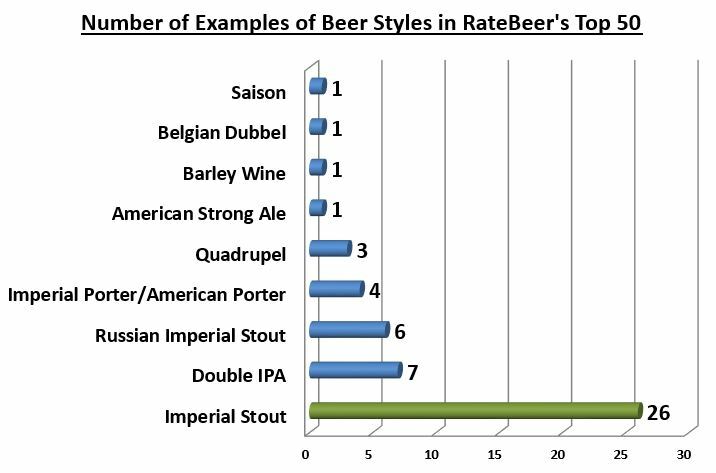 Examples of Imperial Stout dwarfed the next most popular beer style, Double IPA, by almost 400%, making it a statistically significant outlier as represented by the green data point below. Clearly, Imperial Stouts dominate RateBeer’s Top 50, comprising more than half of the beers on the list, which was nearly identical to the percentage of Imperial Stouts on Untappt’s Top 50 (52% vs 54%, respectively). 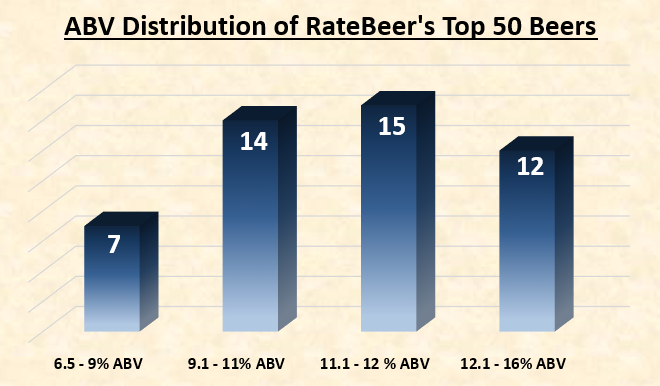 The majority of beers in RateBeer’s Top 50 had an alcohol content of greater than 9%, as can be seen in the chart below. The average ABV of all the beers listed on Untappd’s Top 50 beers was a boozy 11.39%, which is similar to the 11.55% average ABV of Untappd’s Top 50. The beer with the lowest ABV on RateBeer’s Top 50 was “Ann” from Hill Farmstead Brewery weighing in at 6.5%, while the most potent beer on the list was “Buba Extreme Jack Daniels BA” (16%) from the Polish brewery Browar Szałpiw. 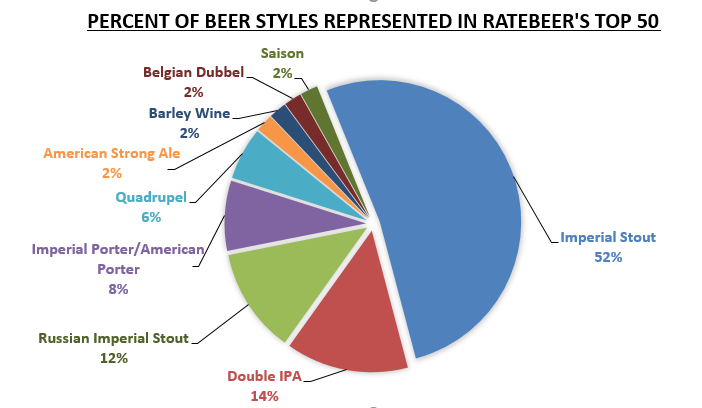 These figures exclude the unlisted ABVs of “Trademark Dispute (Green),” an Imperial Stout from Cycle Brewing, and “Aaron,” a Barley Wine from Hill Farmstead. But seeing as how these beers were on the boozier end of the ABV spectrum, the average ABV of the Top 50 is not likely to be affected much. Similar to both BeerAdvocate and Untappd, the majority (82%) of beers in RateBeer’s Top 50 were from American breweries. As shown in the chart below, only 9 beers in the Top 50 came from non-American breweries; Poland had 1, Sweden 2, and both Denmark and Belgium had 3 each. The average number of beers per state/country listed above is 3.33, and the only state with a statistically significant number of beers in the Top 50 was California with 8, which is considered a statistical outlier. In three impressive cases, all the beers from a given state came from just one brewery, including Toppling Goliath in Iowa, 3 Floyd’s in Indiana, and Bell’s in Michigan. When identifying outliers like California, we try to look for explanations as to why it is performing at a statistically significant level than other states or countries. 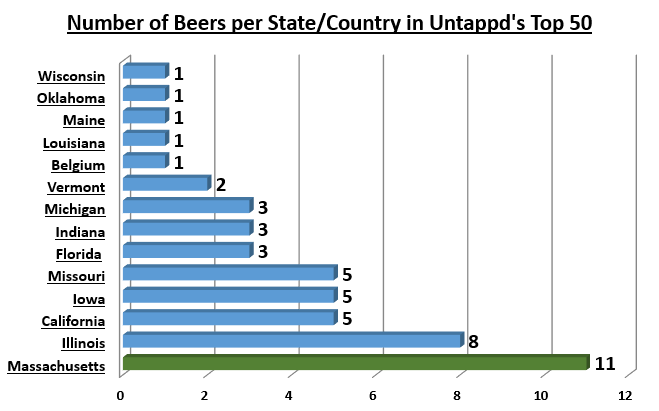 One possible explanation for this is the number of breweries in California compared to other states/countries. For example, some states have more breweries than others, which could potentially increase the number of beers from a given state or country listed in the Top 50. As mentioned, California has the highest number of beers in the Top 50 with a total of 8, which seems rather high at first glance. However, if you consider that there are just over 800 breweries in California as of this writing, the relative number of beers contributed by California to the Top 50 based on the number of breweries in the state was just 1.00%. As shown in the chart above, no longer is California leading in relative terms, but rather Vermont is with 4 from a total of 84 breweries, or 5.48%. Interestingly, 3 out of 4 of the beers from Vermont appearing in the Top 50 were from Hill Farmstead, namely Aaron, Abner, and Ann. In other words, a large part of the reason why Vermont is performing at a statistically significant level is due to Hill Farmstead’s individual level of success. 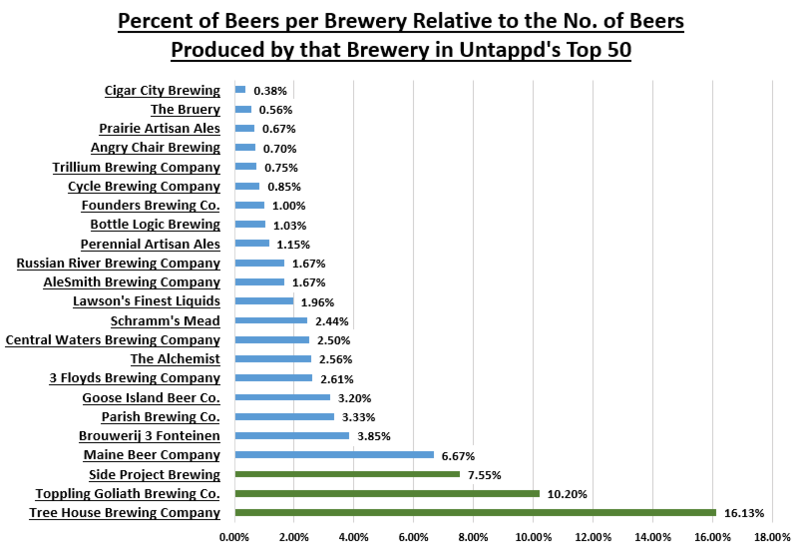 Below is a chart of the number of beers per brewery appearing in RateBeer’s Top 50. The average number of beers contributed per brewery was 1.92. On the face of it, not a single brewery stuck out as contributing a statistically significant number of beers to RateBeer’s Top 50. However, some breweries produce a greater variety of beers than others, which might create a greater potential for breweries that brew a larger variety of beer to have more beers in the Top 50 than others. So let’s take a look at what happens when we consider the relative percentage of beers contributed by a particular brewery based on the number of beers that brewery produces. As shown in green above, there were three breweries with a statistically significant percentage of beers in the Top 50 relative to the total number of beers they produce. These outlier breweries were Toppling Goliath (8.16%), Rochefort (33.33%) and Westvleteren (66.67%). The Belgian breweries of Rochefort and Westvleteren are special cases in that they produce only three beers each which they’ve perfected over hundreds of years, whereas Toppling Goliath is a relatively new American brewery (2009) that produces 49 different beers, one of which sits in first place on both BeerAdvocate and RateBeer’s top 50. Not only is one of Toppling Goliath’s beers the highest rated on both RateBeer and BeerAdvocate’s lists (selling for upwards of $1,000 per bottle on the secondary market), but Toppling Goliath is the only brewery that was consistently determined to be contributing a statistically significant number of beers to the Top 50 relative to the number of beers it produces on BeerAdvocate, Untappd and RateBeer. In other words, a statistical analysis of three separate beer rating sources with more than 10 million reviews combined have shown that Toppling Goliath is living up to its name in a pretty serious way. The Best Beers and Breweries of 2018. Nah, the year ain’t over yet, but we’re just gonna go ahead and let the numbers speak for themselves. Hi, I’m Dan: Beer Editor for Beer Syndicate, Beer and Drinking Blogger, Beer Judge, Gold Medal-Winning Homebrewer, Beer Reviewer, American Homebrewers Association Member, Shameless Beer Promoter, and Beer Traveler. Founded in 2010, Untappd is a popular beer rating mobile phone application among other things. 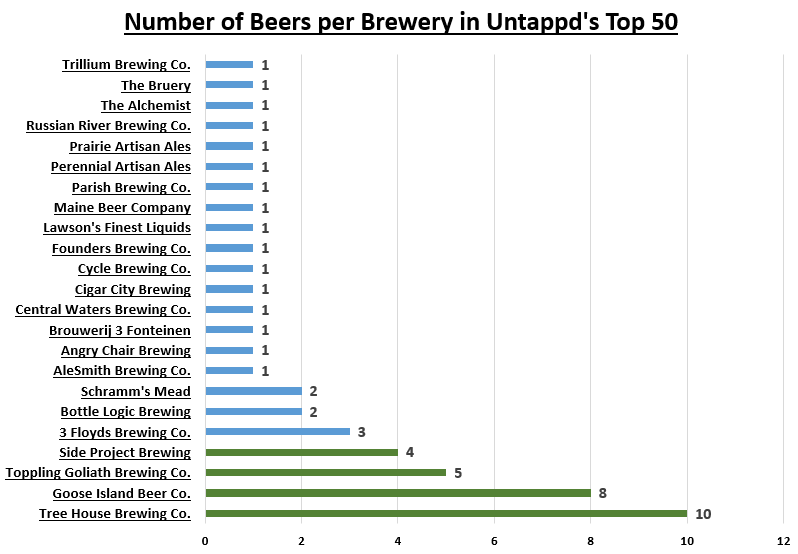 Untappd has exactly 50 beers on its Top Rated Beers list, and of course that data is subject to change over time. We pulled the Untappd’s Top Rated Beers data on 3/7/18, and for your convenience, we created a sortable version of that list which can be used to arrange the results by brewery, beer style, state/country, ABV, etc. 1) Proprietor’s Bourbon County Brand Stout (2014) – Goose Island Beer Co.
2) Rare Bourbon County Brand Stout (2010) – Goose Island Beer Co.
3) Bourbon County Brand Stout Vanilla Rye (2014) – Goose Island Beer Co.
4) Rare Bourbon County Brand Stout (2015) – Goose Island Beer Co.
As you might have noticed, Goose Island’s Bourbon County line of beers dominate the Top 10, gobbling up the first four places in part because of how Untappd often counts different vintages of the same beer as unique entries in the rankings. In fairness to Untappd, the different vintages of Bourbon County are arguably unique beers utilizing a unique set of ingredients. For example, the top rated beer, Proprietor’s Bourbon County Brand Stout (2014), is made in rye barrels with cassia bark, cocoa nibs, panela and coconut water, and weighs in at 13.2% ABV. Compare that to Proprietor’s Bourbon County Brand Stout (2017) aged in bourbon barrels with bananas, roasted almonds, and cassia bark, with an ABV of 14%. Other beer rating websites like BeerAdvocate often collapse a beer of different vintages into one entry, as with Bourbon County Brand Coffee Stout. Not to mention, Untappd leaves beers that are no longer brewed in the Top 50 including the top four beers, whereas such “retired beers” are removed from BeerAdvocate’s Top 50. With that in mind, the flat out leader of Untappd’s Top Rated Beers remains Goose Island, a brewery that is no longer considered a craft brewery by the Brewers Association as of 2011 when the brewery was sold to Anheuser-Busch InBev for a reported $38.8 million. Of the more than the 100 different beer styles in the world, only 10 appear in Untappd’s list of its Top 50 beers. 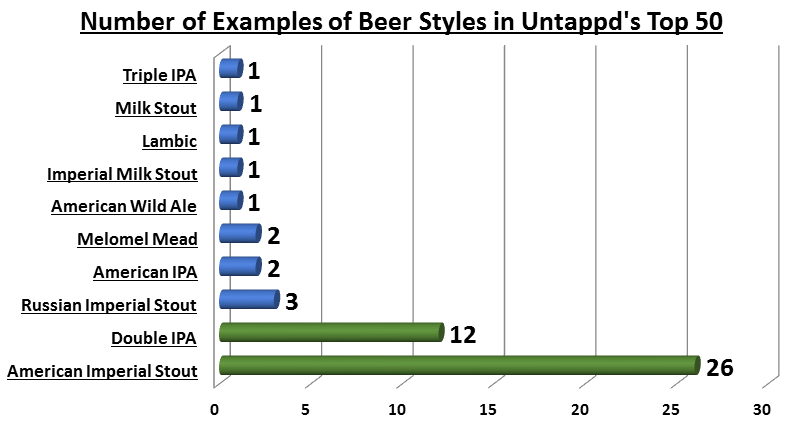 The chart below shows the number of examples of beer styles in Untappd’s Top 50, where both the “Double IPA” and “American Imperial Stout” data points are colored green to indicate that there are a statistically significant number of examples of those beer styles in the Top 50. The variety of beer styles in the Top 50 is even less diverse if you lump “triple IPA” and “Double IPA” under the same category as BeerAdvocate and others do, and likewise combine “Milk Stout” and “Imperial Milk Stout” as one style. The diversity of beer styles shrinks even further if you remove “Melomel Mead,” a kind of fruit honey-wine, as shown in the chart below. 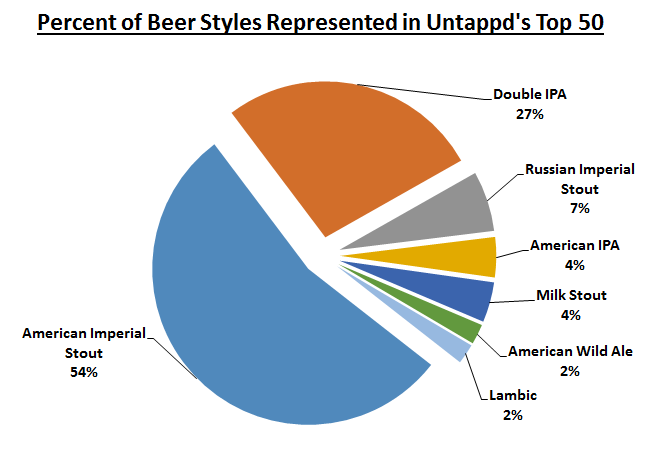 As you can see in chart above, American Imperial Stouts make up fully 54% of the beers in Untappd’s Top 50, while Double IPAs account for 27%, which means that 4 out of 5 beers in Untappd’s Top 50 was one of those two styles of beer. American Imperial Stouts and Double IPAs were also by far the most popular beer styles in both BeerAdvocate’s Top 250 and Top 50. 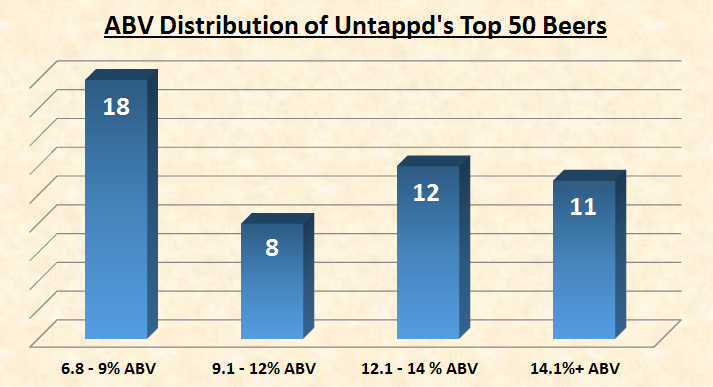 The majority of beers in Untappd’s Top 50 tend to be a bit on the boozy side, as you can see in the chart below. The average ABV is right at 11.55%. The beers with the lowest ABV on Untappd’s Top Rated Beers are “Julius” and “JJJULIUSSS” both from Tree House Brewing Co. and weighing in at 6.8%, while the most potent beer on this list was “Black Tuesday Reserve (2015)” from The Bruery with an alcohol content of 20.5%. These figures exclude the unlisted ABV of “Rare Scoop” from Cycle Brewing. But seeing as how that beer is an American Imperial Stout, the average ABV is not likely to be affected much. With the exception of a single Lambic style beer from Brouwerij 3 Fonteinen of Belgium, all of the beers that appear in Untappd’s Top Rated Beers were from 13 American breweries, which may simply be a result of a predominantly American user base. 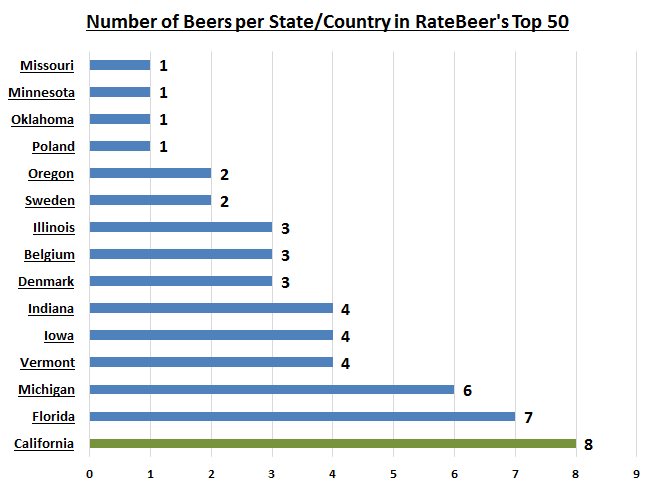 The average number of beers per state/country listed above was 3.57, and the only state with a statistically significant number of beers in the Top 50 was Massachusetts with 11. Interestingly, 10 out of the 11 beers from Massachusetts came from one brewery: Tree House Brewing Company. Of course, some states have more breweries than others, which could potentially increase the number of beers from a given state in the Top 50. For example, California has the third highest number of beers in the Top 50 with a total of 5 beers, which may seem rather high at first glance. However, if we consider that there are just over 800 breweries in California as of this writing, the relative number of beers contributed by California to the Top 50 based on the number of breweries in the state is a mere 0.63%, which is the third lowest relative percentage as shown in the chart below. Even when we look at the numbers this way, Massachusetts is still leading the pack with 11 beers in the Top 50 coming from a possible 168 breweries in the state, or 6.55%. Iowa follows close behind with 5 beers in the Top 50 in a state of 82 total breweries. Similar to Massachusetts, all 5 beers from Iowa came from just one brewery, namely Toppling Goliath Brewing Co. There were a total of 23 different breweries with at least one beer in Untappd’s Top Rated Beers, as shown in the chart below. The average number of beers contributed per brewery was 2.17. 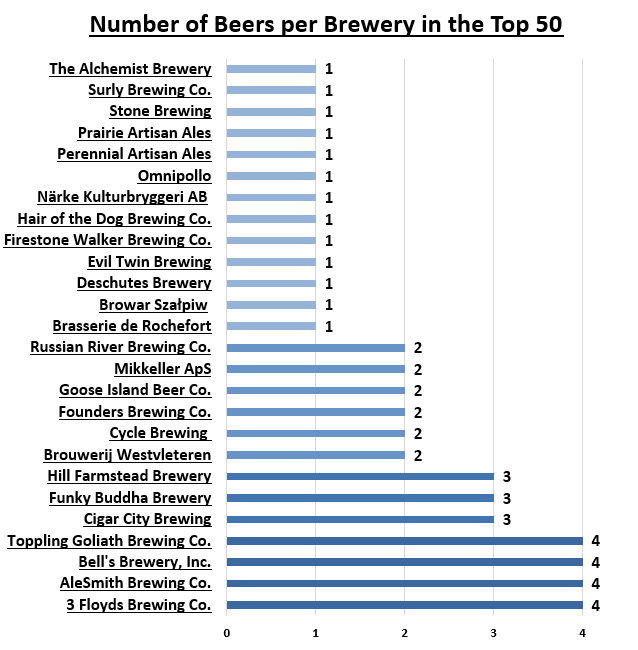 However, any brewery with more than 3 beers in the Top 50 was considered a statistical outlier, which is indicated with a green data point in the chart above. There were exactly four breweries contributing a statistically significant number of beers to Untappd’s list of Top Rated Beers: Tree House Brewing Co. with 11, Goose Island Beer Co. with 7, Toppling Goliath Brewing Co. with 5, and Side Project Brewing with 4. Since some breweries produce a greater variety of beers than others, this might create a greater potential for breweries that beer a larger variety of beer to have more beers in the Top 50 than others. For instance, Goose Island had 7 beers in the Top 50, which was the second highest number of all. However, it turns out that Goose Island produces a whopping 250 different beers, which means just 2.8% of the beers that the brewery makes appeared in the Top 50. Following this line of reasoning, below is a chart showing the percent of beers contributed by a particular brewery based on the number of beers that brewery produces. There were four breweries with a statistically significant percentage of beers in the Top 50 relative to the total number of beers they produce. These outlier breweries are indicated with green data points in the chart above, namely Tree House (16.13%), Toppling Goliath (10.2%), and Side Project (7.55%). The average percentage of beers contributed per brewery relative to the total number of different beers produced was 3.19%, and any brewery with more than 6.78% was considered to be an outlier. Tree House and Toppling Goliath were also found to be contributing a statistically significant number of beers to both BeerAdvocate’s list of Top 250 and Top 50 Beers, which suggests that both of these breweries are of particular note. 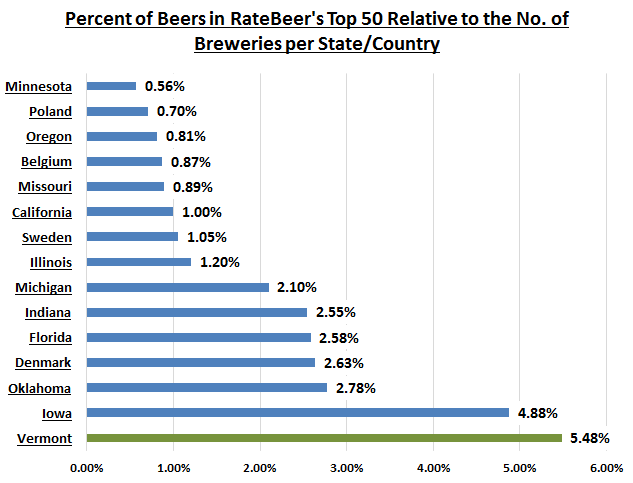 However, there is at least one more major data point to consider in our quest to uncover the ultimate breweries: RateBeer. 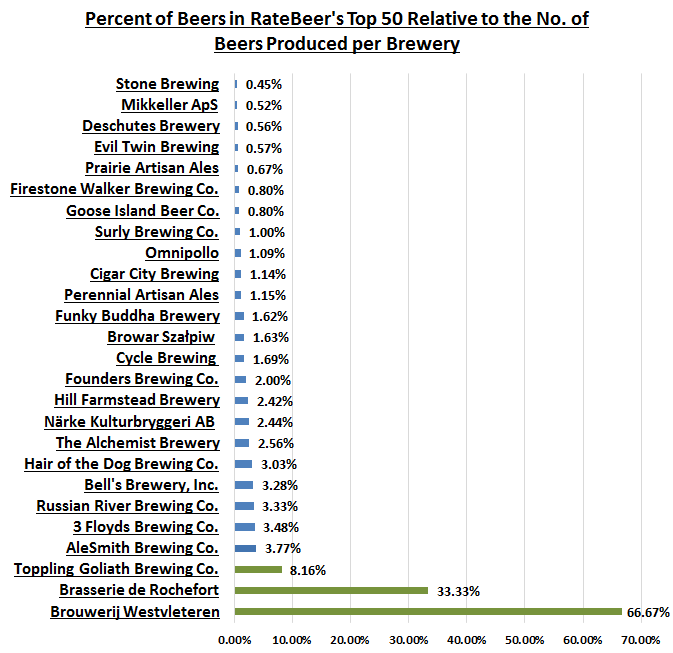 While the data obtained from Untappd is taken at face value for the purposes of this analysis, one is well within reason to further analyze that source data in terms of appropriate beer style grouping for the given commercial examples, ranking methodology, verification of actual breweries in production, etc. In addition, considering that much of the data collected by Untappd is added by its users, one may further wish to question how that user group may affect the overall data (% of English-speakers, % of American users, etc.). Also, the methods and parameters of data analysis herein are but one way of looking at the given information. Furthermore, all of the data collected from Untappd occurred in March, 7th, 2018, and therefore represents a single time-slice of the beer landscape, which of course is subject to change in the future. Lastly, interpretation of the data above is up to the individual, for as the old adage goes, there’s more than one way to brew a beer. Previously on Data Chug, we took a broad look at the Top 250 beers listed on the beer ranking website BeerAdvocate. We highlighted the top 10 beers, identified popular beer styles, ABV trends, the countries and states with the most beers in the Top 250, and more. There were charts, jokes, and a cliffhanger ending that revealed two breweries that appeared a rather curious amount of times in the Top 250. Q1. Last time you mentioned that there were 210,023 different beers listed on BeerAdvocate, so to have a brewery with even a single beer in the Top 250 was impressive. But there were actually several breweries that had more than one beer in the Top 250. What can you tell me about those breweries? A1. Right, so there were 86 breweries in total in the Top 250, and 45 of those breweries had more than one beer on the list. In fact the average number of beers per brewery in the Top 250 was 2.91, so it wasn’t all that unusual for a brewery to have more than one beer in the Top 250. However, what was unusual was that two breweries, namely Trillium Brewing Co. and Hill Farmstead Brewery, both had exactly 20 beers each in the Top 250. This means that nearly 1 out of every 6 beers in the Top 250 was either from Trillium or Hill Farmstead. If having one beer in the Top 250 is impressive, what do you call having 20? Q2. Really impressive? I don’t know— it seems a little bit more than unusual to me. But Trillium and Hill Farmstead weren’t the only outlier breweries with a statistically high number of beers in the Top 250, so what were the other ones? 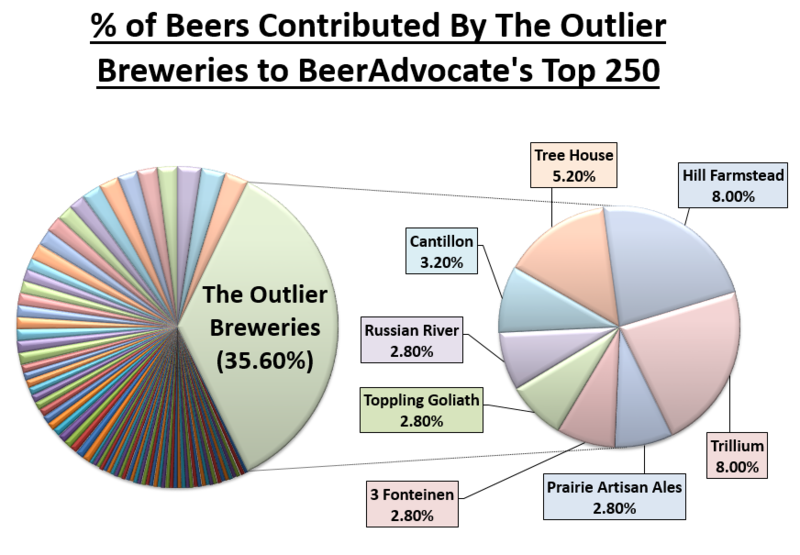 Of the outlier breweries, there were four that had 7 beers each in the Top 250 which included Russian River, Toppling Goliath, 3 Fonteinen, and Prairie Artisan Ales. Next, you had Brasserie Cantillon with 8, Tree House with 13, and as you know, both Hill Farmstead and Trillium both had 20 beers each in the Top 250. By the way, 3 Fonteinen and Cantillon are both Belgian breweries, the rest are American. Interestingly, even though there are only 8 outlier breweries out of a total of 86 breweries in the Top 250, those 8 breweries contributed a combined total of 89 beers to the Top 250, or 35.60%. Q3. Okay, so there are 8 outlier breweries. But still, having 20 beers in the Top 250 like Hill Farmstead and Trillium did just seems crazy. So what’s going on with those breweries? A3. Alright, so imagine that Hill Farmstead and Trillium only produced 20 beers per brewery, and also imagine that every single one of those beers were in the Top 250. Basically, we thought it would be pretty strange if 100% of the beers brewed by any given brewery were all in the Top 250. Q4. So that’s what you found? Every beer brewed by Hill Farmstead and Trillium were in the Top 250? A4. Not exactly. After we looked at the total number of beers currently brewed by each outlier brewery, we found there wasn’t anything necessarily unusual about either Hill Farmstead or Trillium when compared to most of the other outlier breweries. For example, when we pulled the numbers in mid-February of 2018, Hill Farmstead was currently producing 124 different beers, and of those 124, 20 were in the Top 250. In other words, 16.1% of the beers currently produced by Hill Farmstead were in the Top 250. Trillium was at 14.9%. As for the rest of the outliers, 3 Fonteinen was at 26.9%, Cantillon at 22.86%, Tree House was at 20.96%, Toppling Goliath at 14.28%, Russian River at 11.67%, and Prairie Artisan Ales was relatively low in comparison at 4.7%. If you look at it this way, both Trillium and Hill Farmstead weren’t sticking out, but were right in the middle of the pack of the outliers. 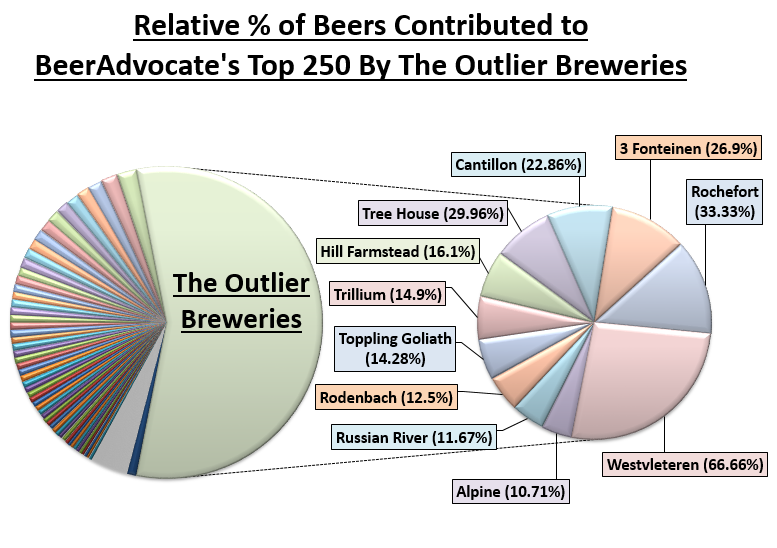 The average percentage of beers contributed per brewery of the outliers was 16.54%. Q5. So what you’re saying is that it’s just a numbers game? Basically, the more variety of beers that a brewery produces, the more that the chances increase that one of those beers will make it into the Top 250? If that’s true, then those percentages that the outlier breweries were putting up would be similar for every brewery, including the non-outliers in the Top 250. So what do the percentages for the non-outlier breweries look like? A6. Okay, so there were initially 8 outlier breweries identified out of a total of 86 breweries in the Top 250, which means there were 78 non-outlier breweries. The Lost Abbey was one of the non-outliers, producing a total of 57 beers, 2 of which appeared in the Top 250. In other words, 3.5% of the beers The Lost Abbey produced were in the Top 250. Likewise, Avery was at 1.7%, Deschutes at 0.56%, Firestone at 3.2%, Other Half Brewing Co. was at 2.02%, etc. After chugging the numbers, it turned out that an outlier brewery was now any brewery that had more than 9.79% of its beers it currently produced in the Top 250. Q7. Wait, so where does that leave Prairie Artisan Ales? It was originally an outlier brewery because it had 7 beers in the Top 250. But because those 7 beers represented only 4.7% of the brewery’s total production, it’s not considered an outlier anymore? A7. That’s right. However, looking at the numbers relative to the quantity of different beers produced per brewery just reinforced the fact that the other outlier breweries were unusual, and appearing in the Top 250 wasn’t just a numbers game. In other words, greatness in the brewing world isn’t simply a matter of throwing enough stuff at the wall until something sticks, at least not according to an analysis of BeerAdvocate’s data. What’s more, we identified 4 new outlier breweries that had more than 9.79% of the beers they currently produced appearing in the Top 250. Those breweries were Alpine Beer Company at 10.71%, Brouwerij Rodenbach N.V. at 12.5%, Brasserie de Rochefort at 33.33%, and Brouwerij Westvleteren at a staggering 66.66%. Of the now 11 outlier breweries, 5 were Belgian, and the other 6 were American. Q8. Alright, these percentages just seem insane. I mean, is there some conspiracy type stuff going on? What does all this mean? A8. Ah, now there’s a question. In statistical analysis, sometimes the juiciest information can be obtained by looking more closely at the outliers. 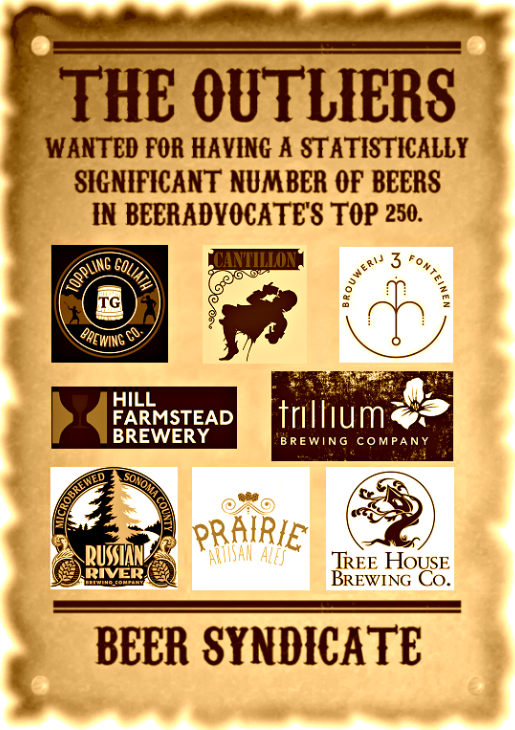 In this case, if you take the data from BeerAdvocate at face value, it could mean that the outlier breweries like Tree House, Toppling Goliath, Trillium, Hill Farmstead, etc. are simply out-preforming all other breweries in the world at a statistically significant level, with respect to specific beer styles. There’s certainly a case to be made that a brewery like Cantillon, founded in 1900, simply specialized and excelled in a limited number of beer styles over many years, and became a world leader par excellence in those specific and relatively sparsely produced categories like Gueuze and Lambic, which are the only kind of beers Cantillon makes. 8 out of 35 beers from Cantillon appear in the Top 250. 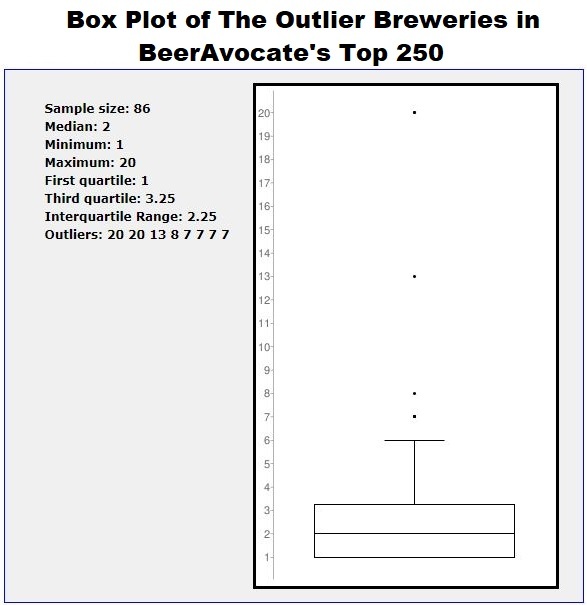 This pattern is similar for the other Belgian outlier breweries such as Brouwerij Westvleteren, a brewery that at first glance seems remarkably unusual with 66.66% of its beers appearing in the Top 250. However, we should also consider that the brewery, founded in 1838, only currently produces 3 beers in total, 2 of which were in the Top 250. One of those beers, Westvleteren 12, was rated a perfect 100/100 by RateBeer, and is considered by some sources to be the best beer in the world. You may include Rochefort (founded 1595), Rodenbach (1821), and 3 Fonteinen (1887) into that list of Belgian breweries that produce a relatively small variety of beers, but have perfected those beers over generations, and are consistently recognized as world-class breweries, often epitomizing the beers styles they produce. Similar to the production range of Brouwerij Westvleteren, Rochefort only produces 3 beers, 1 of which (or 33%) was in the Top 250. Rodenbach essentially invented and mastered the Flanders Red style, the only style of beer it brews, so it wasn’t surprising to see 1 of the 8 beers it produces (Caractère Rouge) in the Top 250. Likewise, 3 Fonteinen specializes predominately in Lambic and Gueuze, and contributed 7 of its 26 beers to the Top 250. Q9. 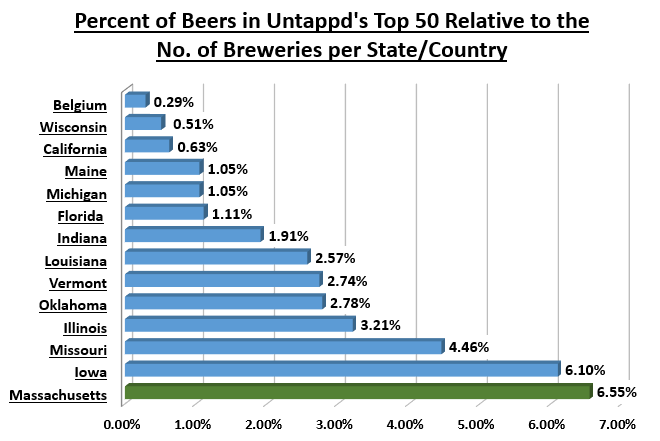 Okay, maybe that explains the Belgian breweries somewhat, but what about the American outliers? A9. Unlike the Belgian outlier breweries that typically only brew a small variety of beer styles, most of the American outliers brew a wider range, but they tend to specialize or excel at one particular beer style. For example, the majority of beers contributed by Alpine (founded 1999), Tree House (2012), and Trillium (2013) in the Top 250 are hop-forward beer styles. Russian River, founded in 1997, is widely known for its Pliny the Elder and Pliny the Younger double and triple IPAs, both of which appear in the Top 250 and were also rated 100/100 by RateBeer. In addition to mastering the double IPA, a beer style the brewery is credited with inventing, Russian River was one of the first American breweries to specialize in sour and barrel-aged beers, and led in the American Wild Ale category with 5 beers in the Top 250. Toppling Goliath (founded in 2009) is a bit of a mixed bag with 3 examples of imperial stout in the Top 250, along with 4 examples of hop-forward styles. Likewise, Hill Farmstead (founded 2010) has 12 hop-forward styles in the Top 250, and the rest are a mix of saisons, stouts and a single porter. But even though Hill Farmstead produces a variety of beers compared to most of the other outliers, it was awarded the title of “Best New Brewery in the World” by RateBeer in 2011, and “Best Brewery in the World” every year from 2013-2017. Q10. Interesting, but when I looked at BeerAdvocate’s list of all American IPAs and there were literally beers there with PERFECT scores. None of those perfect scoring beers appeared in the Top 250, so what gives? A10. You’re correct, you might find several beers with perfect scores listed under many different beer style categories, but many of those perfect scores came from only one reviewer. The fact is that BeerAdvocate’s ranking algorithm weights a beer’s score based on the number of reviews the beer has had, which is why those higher rated beers don’t appear in the Top 250. What this means is that there very well could be and probably are better commercial examples of certain beer styles out there than those that appear in the Top 250, but it may take a little while until more of the BeerAdvocate user base has a chance to weigh in on those beers. What this suggests is that the many of the current outlier breweries will not be there forever. Nonetheless, we should probably expect to see some of the Belgian outlier breweries in the Top 250 for a while, particularly those breweries producing time-intensive beers styles like Lambic, Gueuze and Flanders Red. These beer styles often take upwards of three years to produce, not to mention the perhaps generations of knowledge needed to perfect those styles. All of this makes it cost-prohibitive for other breweries to attempt, which limits the respective competition. For now, what we can say with certainty is that there are a relatively small number of breweries on BeerAdvocate’s Top 250 that are contributing a statistically significant number of beers to that list. And outliers typically demand attention especially in situations where it’s clear that the outliers were not due to simple data collection errors. By the way, the data we used is open to the public to independently verify. We’ve even made it easy to sort the data by state, country, brewery, score, etc. In other words, feel free to chug the numbers yourself. Here’s the link: BeerAdvocate’s Top 250. Q11. You know, we spent all this time talking about the “Top 250 beers,” but did you ever consider the source of that data? What I mean is that if the user base is predominately English-speaking Americans, doesn’t that skew the data in favor of American breweries? A11. You’re not wrong. I wonder, is that the same as saying “you’re not not not wrong?” Anyways, what I mean is that you’re right, or not not right. Basically, it’s more likely that the results of the beers in the BeerAdvocate’s Top 250 had less to do with a conspiracy, and more to do with the demographics of the website’s user base and how the algorithm functions. Even so, outliers still exist within this particular data set, and statistically speaking, those outlier breweries deserve a spotlight. Of course, interpretation of that data can be tricky. Q12. Okay, so you’re admitting that BeerAdvocate’s Top 250 is just one data set and it may be limited by certain factors including its user base which you speculate is dominated by American English-speakers. Rarity and hype might also be factors. Come to think of it, if you’re trying to independently verify if there is anything special about those outlier breweries you mentioned, don’t you think you should look more thoroughly at other data sets? Like, did you even think to analyze Untappd’s list of Top Rated beers to see how it compares to BeerAdvocate’s list? A12. “Untappd” you say? You mean the geosocial networking service and mobile phone application that allows its users to rate beers and earn digital badges to increase the users average time spent on the app? That Untappd? Why, yes, we did think to analyze that data. In fact, we did more than just think about it. We pulled the data, chopped it up, ran a statistically analysis, and put it all together just for you. Q13. Alright, let’s have it. Anything juicy? 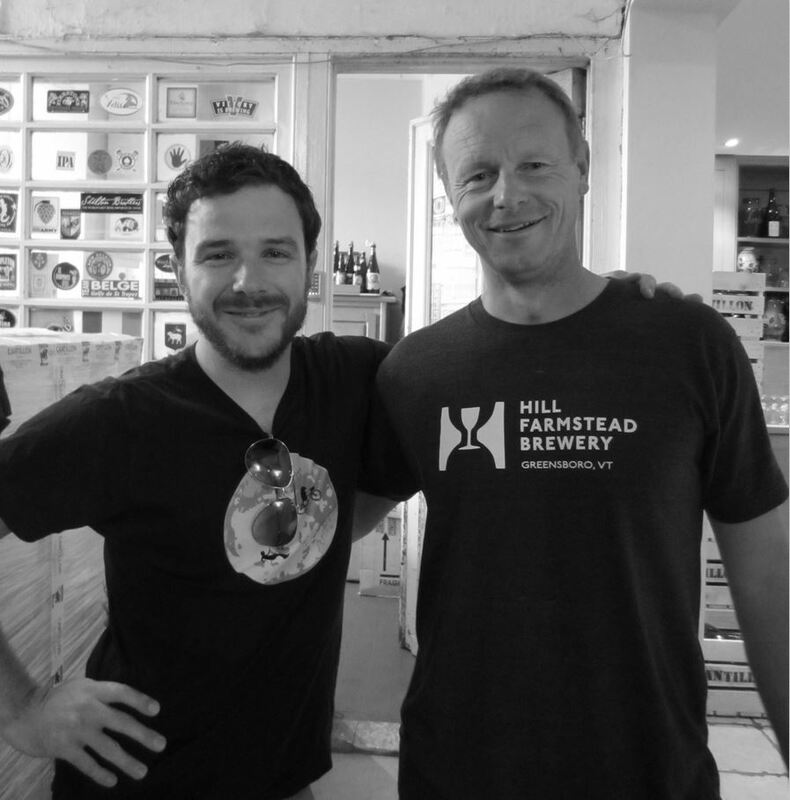 Dan with Owner and Brewer Jean-Pierre van Roy of Brasserie Cantillon Seen Sporting a Hill Farmstead T-Shirt.